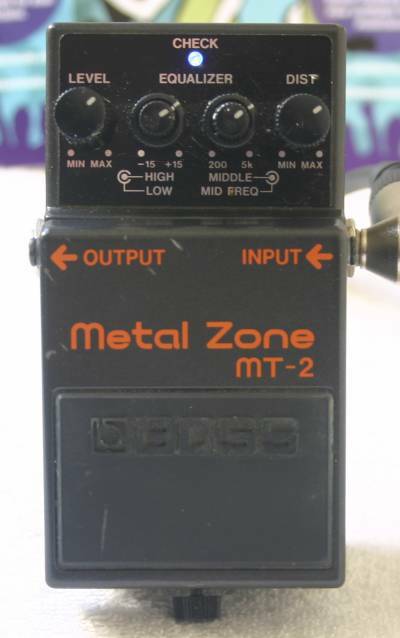 The MT-2 is Boss’s best selling pedal and for good reason. It absolutely nails the tight compressed distortion required for modern rock sounds. However, despite this the pedal has a nasally sound and can sound thin up the top. This can be fixed and turns a good pedal into a great one. The Metal Road mod started out as a simple mod but early on I was unhappy with the loss of Mid EQ control of the original mod so have tweaked it to further develop this mod. There are other mods around for the MT-2 which don’t address the nasally sound problem, but this mod does. There are also other mods that are ‘overkill’ and change so many parts that the character of the Metal Zone is surrendered. The pedal now simulates the Marshall – Boogie sound extremely well, with a tight distortion and searing gain levels. The pedal sustains at will and with a little whammy action 2nd and 3rd harmonics are easy to achieve. This is THE mod for the Metal Zone. The mod includes an extra bright blue L.E.D instead of stock red L.E.D and a brand new 9 volt battery. Boss MT2 Metal Road Mod: MATE!!! What can I say…. Words do not describe how much more BALLZ my pedal has. You are a genius. Thank you so much! awesome trader, i cant stress it more. also, the pedal has been tested on live gig and i cant believe how this pedal have improved a lot. usually i cant turn the distortion all the way up because of the noise that its generating, its really annoying. the sustain have improved a lot as well since the annoying noise is gone you can turn the distortion up which triggers the sustains. if you like MT-2 then definitely this mod is for you.